The other night I brought dessert to a family dinner, as I often do, and as usual I hoped it would taste okay. I'm not so confidant about my desserts. On tasting her piece, my seven-year-old granddaughter, Miss E, declared that I was the best dessert maker in the whole wide world. Hahaha, imagine that. Then she said I should write a cookbook with only desserts. And send it to the President! So what did I bake to earn such an enthusiastic endorsement? It was an easy-to-throw-together blueberry/strawberry lemon cake that has appeared on these pages before. But since it got such a high approval rating, I thought I'd reprise it. It's basically the same as the cake in this post except I added a flax egg and a blueberry glaze, and baked it in a round cake pan instead of a square one. It rose so beautifully and had such a pleasant taste and texture, I'm going to make it more often. bake in a 9"x9x2" square pan or a 9 x 3" round pan. 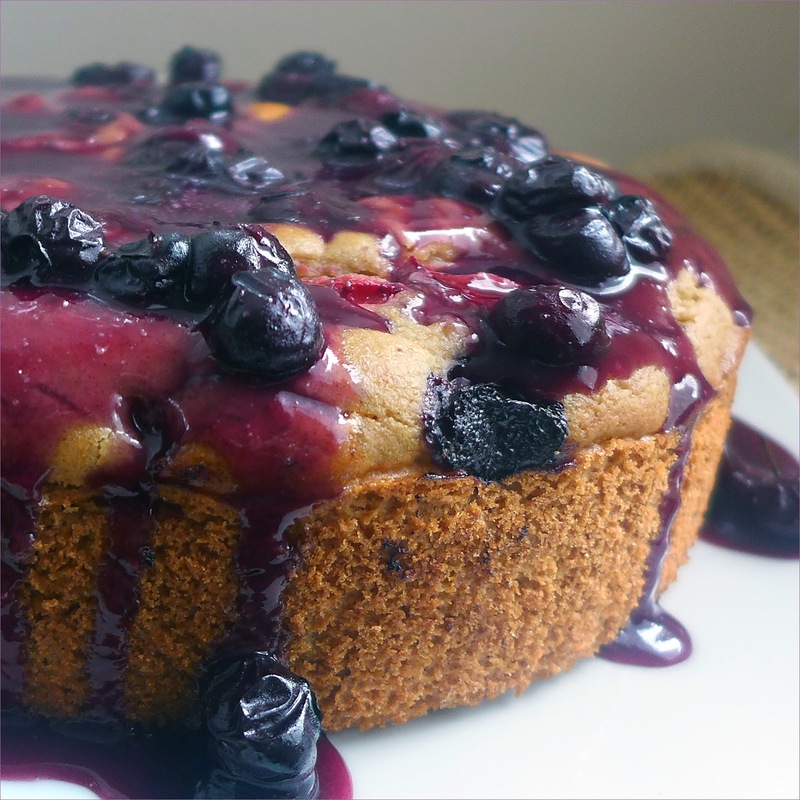 1.5 cups fresh blueberries or 1 cup blueberries plus 1/2 cup strawberries cut similar size to blueberries. The strawberries amp up the flavor. Preheat oven to 400 degrees. Lightly oil pan and line the bottom with parchment paper cut to size. Place the flax meal in a 1-cup glass measuring cup and add the water. Let sit while you measure the dry ingredients. Add the GF flour, almond meal, oat flour, baking powder, baking soda, salt and cinnamon to a large mixing bowl. Whisk together all the dry ingredients until thoroughly mixed. Beat the flax with a fork until gluey. Add the (cut-up) lemon to the cup. Add almond milk to make one cup. Mix together. Add the wet ingredients to the dry, scrapping out the blender to retrieve all the batter. Beat with a spoon or an electric hand mixer until the dry ingredients are well incorporated. Add half the berries and fold in. 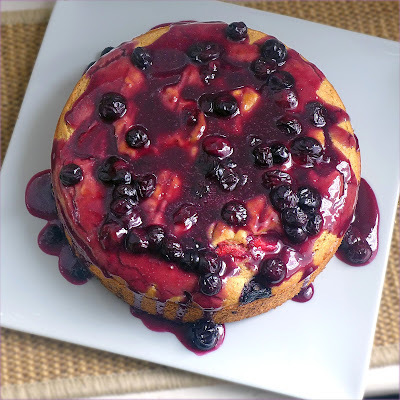 Place the batter into the greased pan and spread the remaining berries evenly over the top. Press in gently, so they still show on top. Bake for 20 to 30 minutes, or until the top is golden and a toothpick inserted in the center comes out clean. Cool in the pan about 15 minutes before removing from the pan by inverting onto a rack then turning right side up onto a second rack. Let cool completely before transferring to a serving plate. 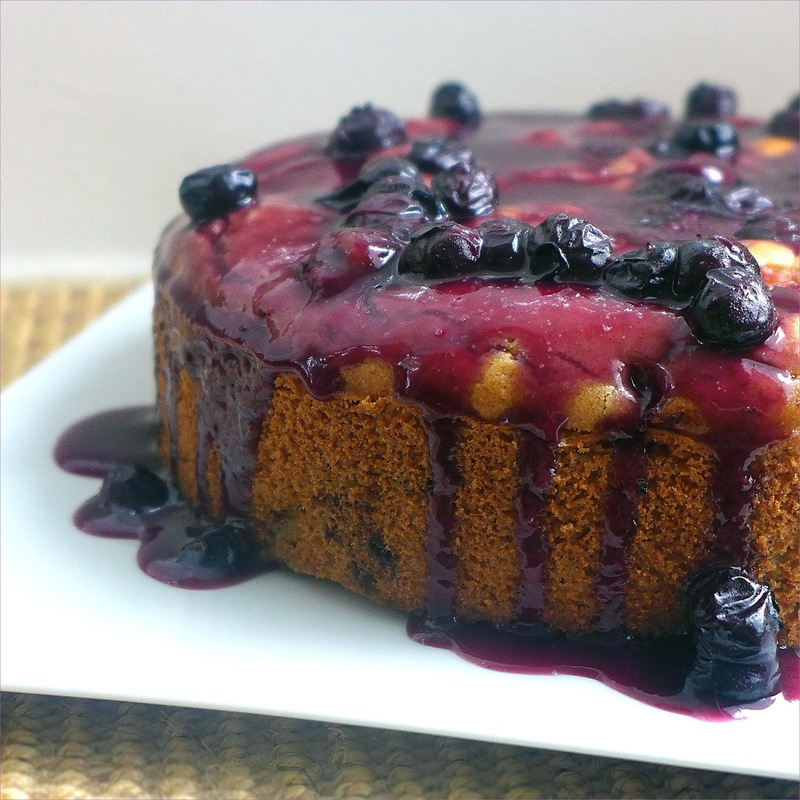 I made a simple blueberry glaze to pour over the top of the cooled cake, but it doesn't really need one.